In the sixth month, the angel Gabriel was sent from God to a town of Galilee called Nazareth, to a virgin betrothed to a man named Joseph, of the house of David, and the virgin’s name was Mary. And coming to her, he said, “Hail, favored one! The Lord is with you.” But she was greatly troubled at what was said and pondered what sort of greeting this might be. Then the angel said to her, “Do not be afraid, Mary, for you have found favor with God. Behold, you will conceive in your womb and bear a son, and you shall name him Jesus. He will be great and will be called Son of the Most High, and the Lord God will give him the throne of David his father, and he will rule over the house of Jacob forever, and of his kingdom there will be no end.” But Mary said to the angel, “How can this be, since I have no relations with a man?” And the angel said to her in reply, “The holy Spirit will come upon you, and the power of the Most High will overshadow you. Therefore the child to be born will be called holy, the Son of God. And behold, Elizabeth, your relative, has also conceived a son in her old age, and this is the sixth month for her who was called barren: for nothing will be impossible for God.” Mary said, “Behold, I am the handmaid of the Lord. 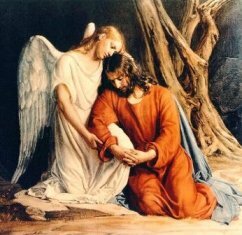 May it be done to me according to your word.” Then the angel departed from her. ​When the days were completed for their purification according to the law of Moses, they took him up to Jerusalem to present him to the Lord, just as it is written in the law of the Lord, “Every male that opens the womb shall be consecrated to the Lord,” and to offer the sacrifice of “a pair of turtledoves or two young pigeons,” in accordance with the dictate in the law of the Lord. After three days they found him in the temple, sitting in the midst of the teachers, listening to them and asking them questions, and all who heard him were astounded at his understanding and his answers. When his parents saw him, they were astonished, and his mother said to him, “Son, why have you done this to us? Your father and I have been looking for you with great anxiety.” And he said to them, “Why were you looking for me? Did you not know that I must be in my Father’s house?” But they did not understand what he said to them. He went down with them and came to Nazareth, and was obedient to them; and his mother kept all these things in her heart. And Jesus advanced [in] wisdom and age and favor before God and man. And the soldiers wove a crown out of thorns and placed it on his head, and clothed him in a purple cloak, and they came to him and said, “Hail, King of the Jews!” And they struck him repeatedly. So they took Jesus, and carrying the cross himself, he went out to what is called the Place of the Skull, in Hebrew, Golgotha. And when they came to a place called Golgotha (which means Place of the Skull), they gave Jesus wine to drink mixed with gall. But when he had tasted it, he refused to drink. After they had crucified him, they divided his garments by casting lots; then they sat down and kept watch over him there. And they placed over his head the written charge against him: This is Jesus, the King of the Jews. But at daybreak on the first day of the week they took the spices they had prepared and went to the tomb. They found the stone rolled away from the tomb;but when they entered, they did not find the body of the Lord Jesus. While they were puzzling over this, behold, two men in dazzling garments appeared to them. They were terrified and bowed their faces to the ground. They said to them, “Why do you seek the living one among the dead? He is not here, but he has been raised. Remember what he said to you while he was still in Galilee, that the Son of Man must be handed over to sinners and be crucified, and rise on the third day.” And they remembered his words. Then he led them [out] as far as Bethany, raised his hands, and blessed them. As he blessed them he parted from them and was taken up to heaven. They did him homage and then returned to Jerusalem with great joy, and they were continually in the temple praising God. 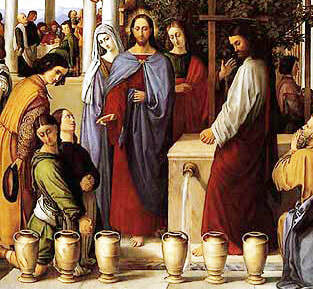 On the third day there was a wedding in Cana in Galilee, and the mother of Jesus was there. Jesus and his disciples were also invited to the wedding. When the wine ran short, the mother of Jesus said to him, “They have no wine.” [And] Jesus said to her, “Woman, how does your concern affect me? My hour has not yet come.” His mother said to the servers, “Do whatever he tells you.” Now there were six stone water jars there for Jewish ceremonial washings, each holding twenty to thirty gallons. Jesus told them, “Fill the jars with water.” So they filled them to the brim. Then he told them, “Draw some out now and take it to the headwaiter.” So they took it. And when the headwaiter tasted the water that had become wine, without knowing where it came from (although the servers who had drawn the water knew), the headwaiter called the bridegroom and said to him, “Everyone serves good wine first, and then when people have drunk freely, an inferior one; but you have kept the good wine until now.” Jesus did this as the beginning of his signs in Cana in Galilee and so revealed his glory, and his disciples began to believe in him. About eight days after he said this, he took Peter, John, and James and went up the mountain to pray. While he was praying his face changed in appearance and his clothing became dazzling white. And behold, two men were conversing with him, Moses and Elijah, who appeared in glory and spoke of his exodus that he was going to accomplish in Jerusalem. Peter and his companions had been overcome by sleep, but becoming fully awake, they saw his glory and the two men standing with him. Then from the cloud came a voice that said, “This is my chosen Son; listen to him.” After the voice had spoken, Jesus was found alone. They fell silent and did not at that time tell anyone what they had seen. Then he took the bread, said the blessing, broke it, and gave it to them, saying, “This is my body, which will be given for you; do this in memory of me.” And likewise the cup after they had eaten, saying, “This cup is the new covenant in my blood, which will be shed for you. The Blessed Virgin Mary promised to Saint Dominic and to all who follow that "Whatever you ask in the Rosary will be granted." She left for all Christians Fifteen Promises to those who recite the Holy Rosary.